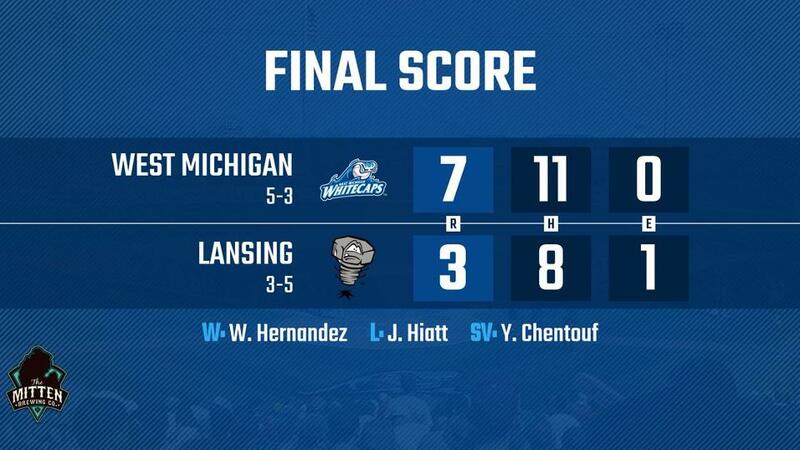 LANSING, MI - The West Michigan Whitecaps enjoyed a successful offensive performance for the third consecutive day, tallying 11 hits as part of a 7-3 victory over the Lansing Lugnuts Thursday at Cooley Law School Stadium. In the second, Ulrich Bojarski launched his second homer in as many days with a two-run shot to open the scoring. Two innings later, Jose King drove in his first run with the team, plating Parker Meadows with a run-scoring single to increase the lead to 3-0. After the Lugnuts scored a run in the fifth, West Michigan broke the game open with three in the seventh. Run-scoring doubles by Nick Ames and Parker Meadows with an RBI-triple from Jeremiah Burks extended the 'Caps lead to 6-1. Meadows reached base for the fourth time with an RBI-single in the ninth and close the scoring on a 7-3 Whitecaps victory and taking three of four games of their series in Lansing. Wilkel Hernandez (1-1) grabbed his first victory of the season as the Whitecaps starter tossed five innings of one-run baseball while striking out six. Lugnuts pitcher Josh Hiatt (0-2) gave up three runs in four innings in suffering his second 'Caps loss of the 2019 season. Reliever Yaya Chentouf tossed a pair of scoreless innings to notch his second save of the year, as well as his second of the series with Lansing. The Whitecaps record improves to 5-3 while Lansing drops to 3-5. Ames reached base in all five of his plate appearances with two doubles, three runs scored and three walks. Meadows enjoyed his best day with West Michigan, going 3-for-4 with a run, stolen base, double and two RBIs as part of the victory. The 'Caps 11 hits marked the third straight game in which West Michigan record double-digit hits, and the win gives the club a three-game winning streak. The Whitecaps return to West Michigan for a six-game homestand beginning with a three-game set against the Great Lakes Loons beginning Friday from Fifth Third Ballpark at 6:35 pm. Pitcher Carlos Guzman makes his second start of the year - both of which have taken place at home -- against Loons pitcher Guillermo Zuniga. Broadcast coverage with Dan Hasty and Mike Coleman starts on the Whitecaps Baseball Network at 6:25 pm. Tickets are available for any Whitecaps 2019 home contest by calling the Whitecaps front office at 616-784-4131 or by visiting www.whitecapsbaseball.com.